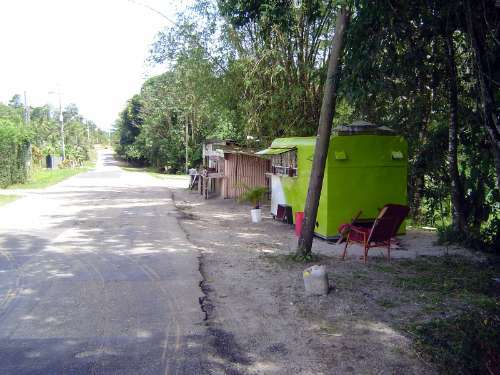 If the previous folder showed images of a new Trinidad, here is a set showing an older one. 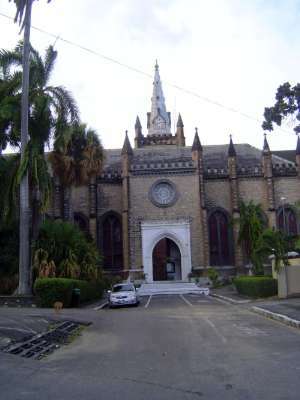 Trinity Cathedral, commissioned by Governor Ralph Woodford and completed in 1818. 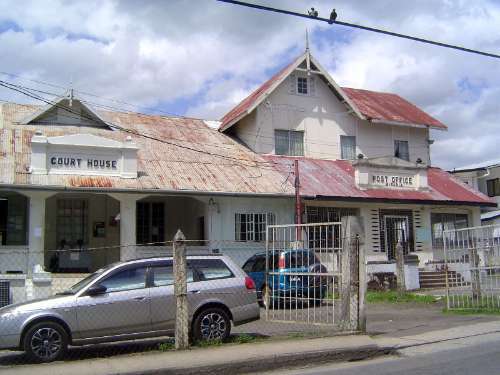 Woodford, who was governor from 1813 to 1828--a remarkably long tenure, longer than any other governor in Trinidad's history--was largely responsible for building the town. Woodford had been appointed governor at the age of 29; 15 years later, he died at sea on his way to England. 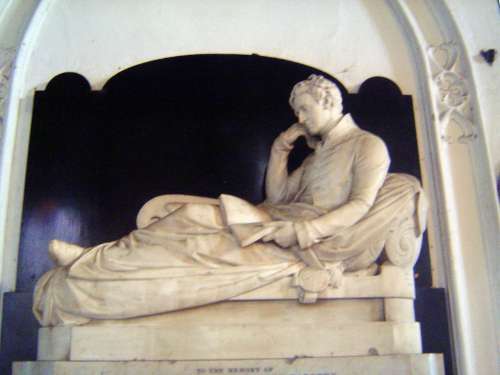 The cathedral has this statue of him, done by the eminent Francis Chantrey, a prodigiously successful sculptor responsible for work scattered across the British Empire. 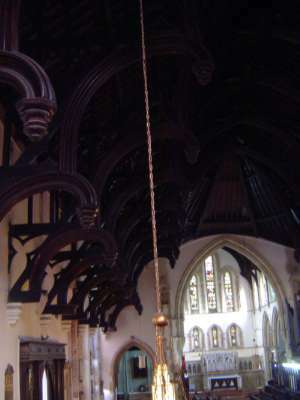 The most striking feature of the cathedral is these trusses. 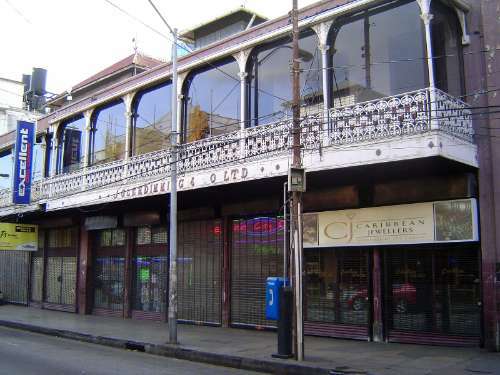 The building--from an era when men wore many hats--was designed by Woodford's colonial secretary, Philip Reinagle. 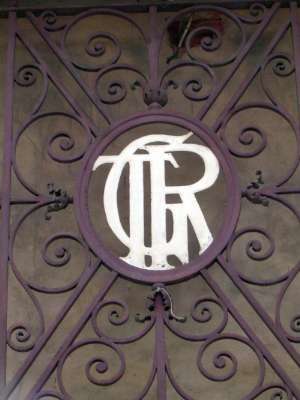 Logo on the station building of the former Trinidad Government Railroad. 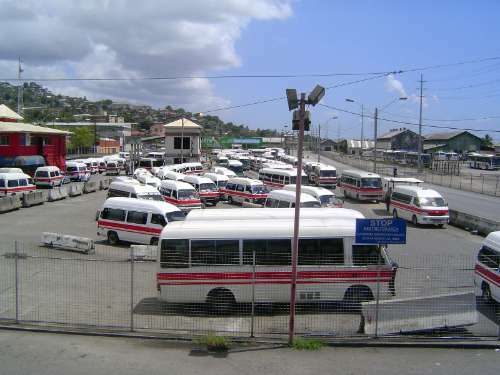 The tracks leading to the station have been removed, and the wedge-shaped patch of ground is now a parking lot for buses. 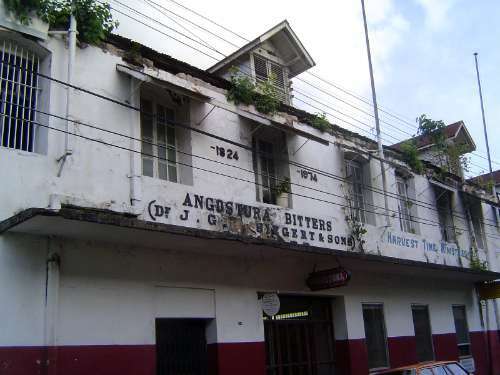 Nearby, the old building of Angostura Bitters, a company with a long history on Trinidad. 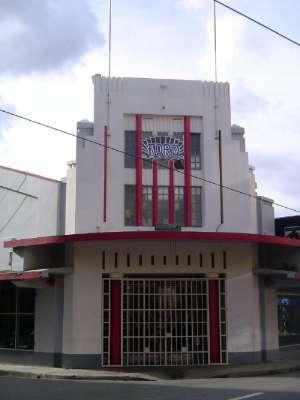 An elegant old Ford dealership. 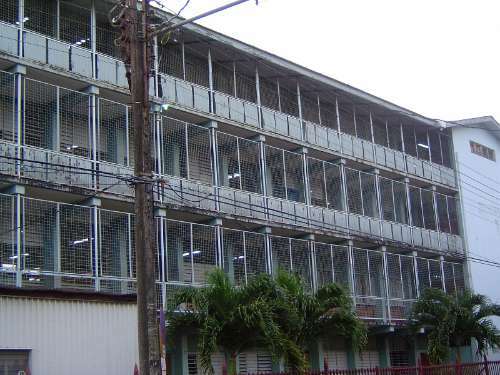 Could be a jail, but it's the same school. 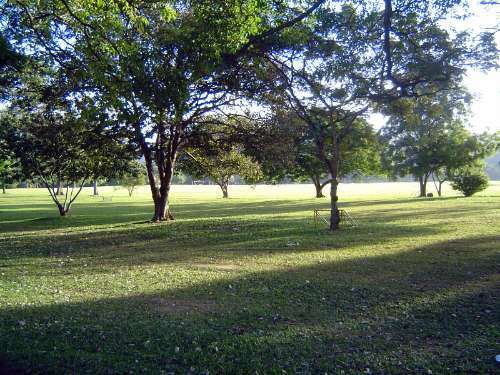 The Queen's Park Savannah. 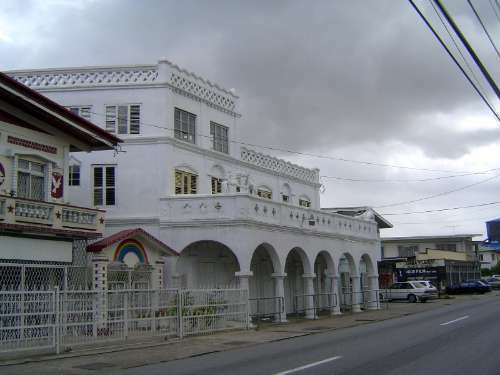 on the north side of the city, was originally the Paradise Estate, a sugar plantation. 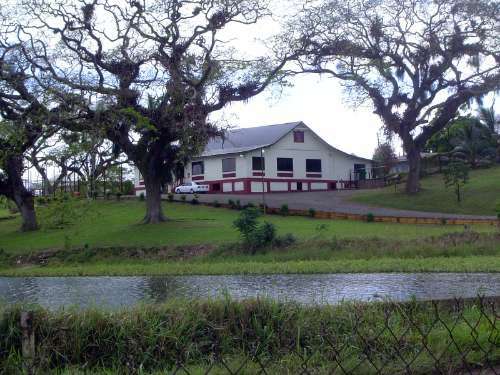 Governor Woodford bought it in 1818 and made it a park "for the recreation of the townfolk and the pasturage of cattle." Facing the savannah, this is Knowsley, built in 1904 for William Gordon Gordon, a Scotsman who arrived in 1864 and with a partner set up Gordon Grant & Company, still in the shipping and insurance business. 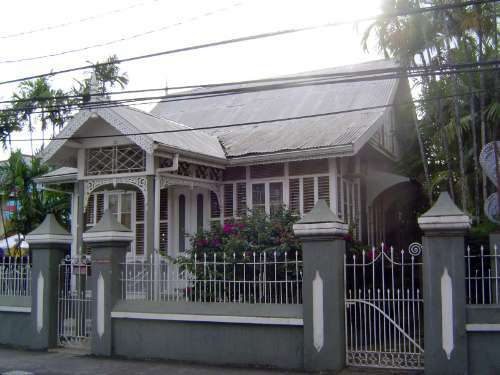 The house was sold in 1956 to the Government of Trinidad and now houses the ministry of foreign affairs. 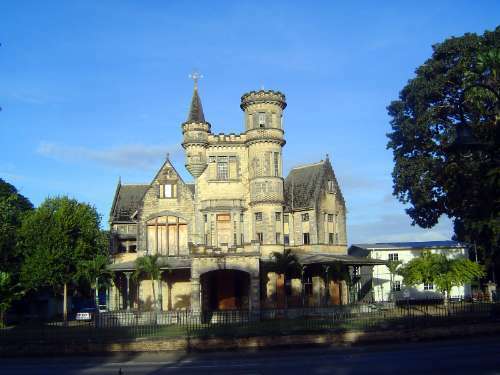 Stollmeyer's Castle, also facing the park and also from 1904. The Stollmeyers chose not to move in, but their son did and lived here until his death in 1965. 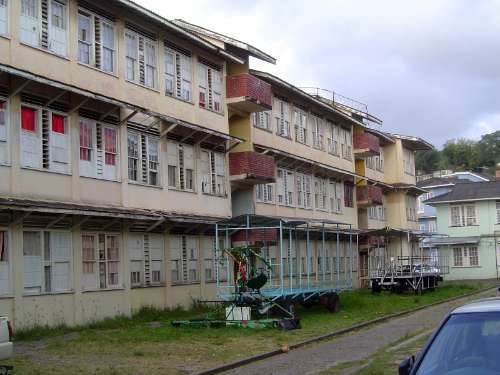 Acquired by the Trinidad and Tobago Government in 1979. 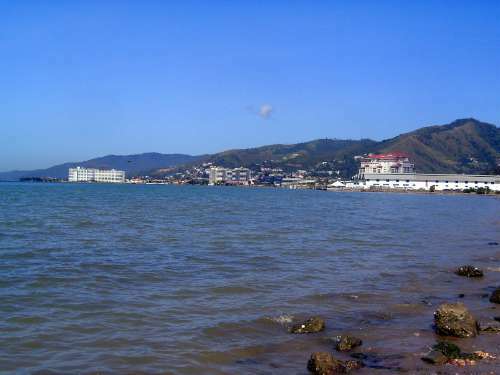 Looking north to Chaguaramas, site of a U.S. Navy a base in and after World War II. The base originated as a Lend-Lease undertaking. 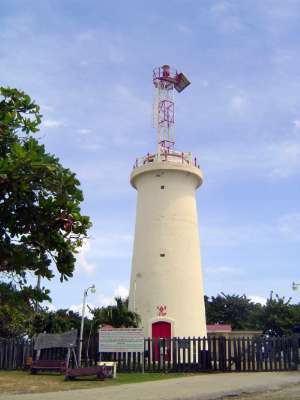 Former entrance to the base. 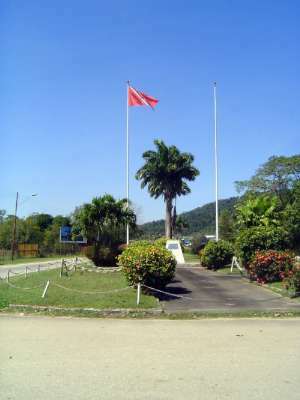 Farther east--east of Piarco Airport--is the old Waller Field, a major stopping point for airplaces heading to Africa during World War II. 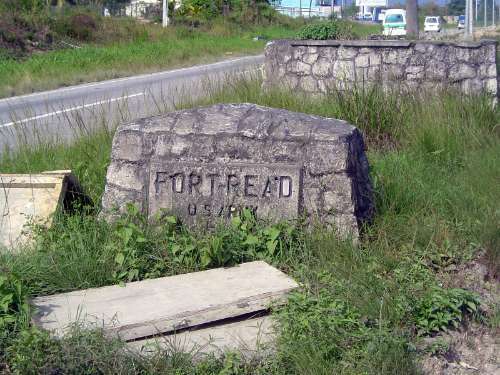 Adjoining it was a U.S. Army installation, whose west gate was here. Close-up. 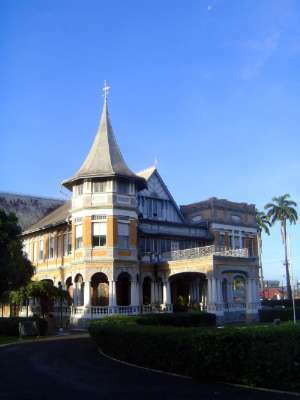 The Colonial Office in London published an Annual Report on Trinidad and Tobago for the Year 1946. Such reports had been suspended during the war, and so in 1946 the report summarized events since 1940. Speaking of 1941, the report states, "This was perhaps the most epochal year in the history of the Colony. It marked the commencement of a change in the economic and social life and outlook of the people. United States personnel began to arrive. The construction of Bases provided considerable employment at high wages.... A new El Dorado loomed on the horizon. This small and distant outpost had become the seat for one of the greatest experiments in international relationship.... 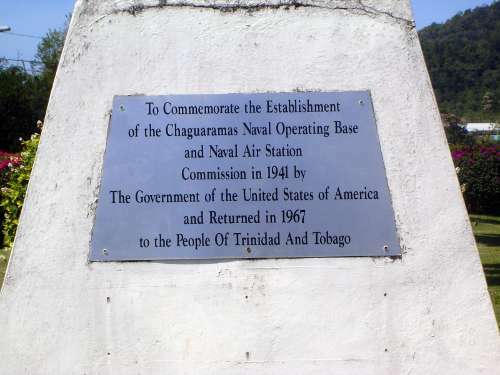 The arrival of a token force of one hundred United States Marines on March 23rd heralded the advent of several thousand troops... in addition to countless other civilian workers who had been pouring in to construct the Naval Base at Chaguaramas and the Military Encampment at Fort Read...."
Quick snack en route to Toco. 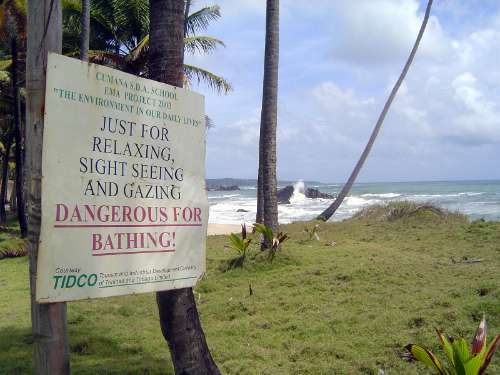 Warning sign. The Gulf Stream passes by, creating a dangerously strong current for all except those keen on a quick trip to the North Atlantic. 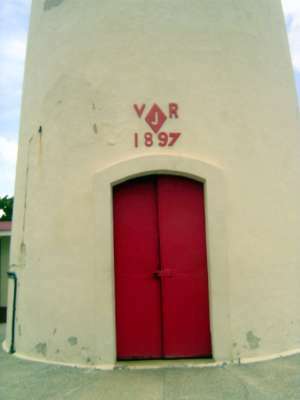 The tower was built on the 60th anniversary of Queen Victoria's accession. Hence the "J," for Victoria Regina's Jubilee. 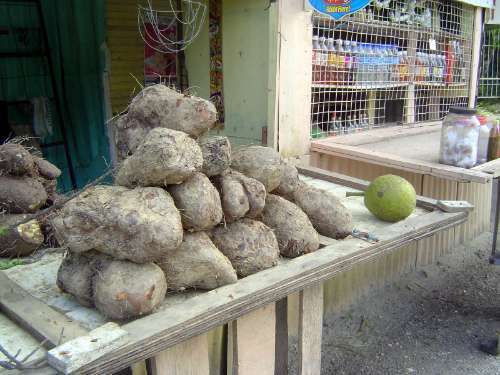 Serious yams, along with a solitary breadfruit. 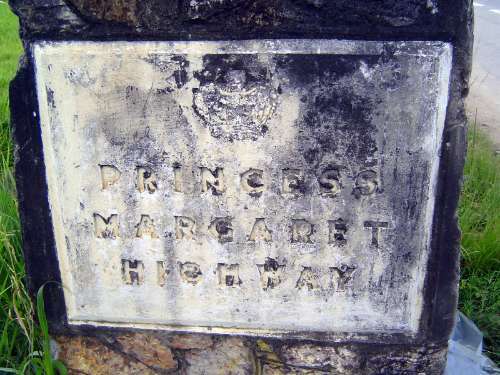 Lost in traffic: a marker at the start of the highway south to San Fernando. 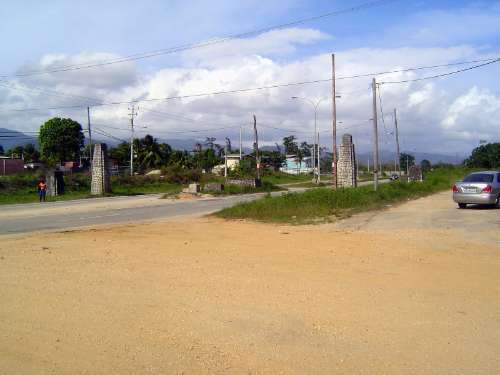 Despite the sign, the highway is popularly called the Uriah Butler Highway. 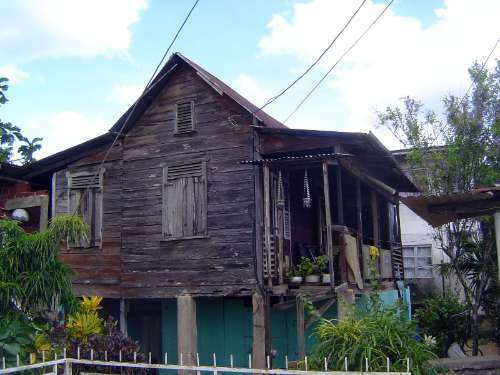 In Chaguanas, a largely Indian town, this house has a sign reading: Anand Bhavan, House of Bliss, 1926, restored 2001. Restaurant downstairs; house up. The name Cow Heel King refers to an item on the menu, Cow Heel soup. 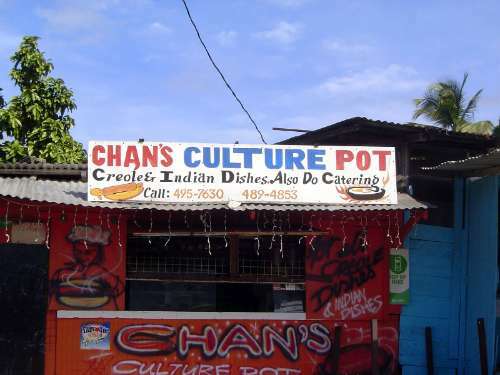 The Hindu proscription on beef is widely ignored in Trinidad. 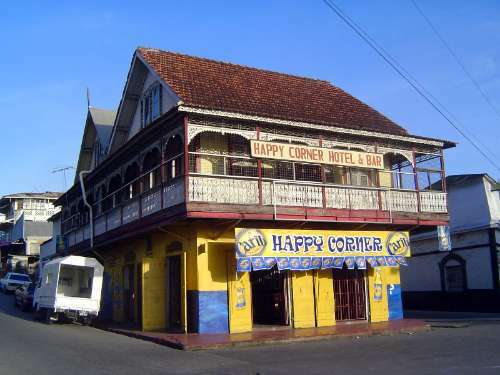 Hotel in downtown San Fernando. 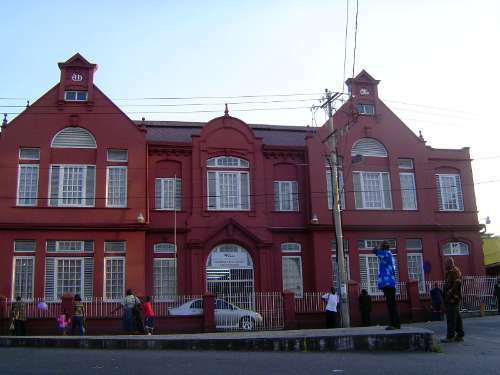 San Fernando Public Library, 1916. Out in the countryside, road signs point to Ackbar Trace. 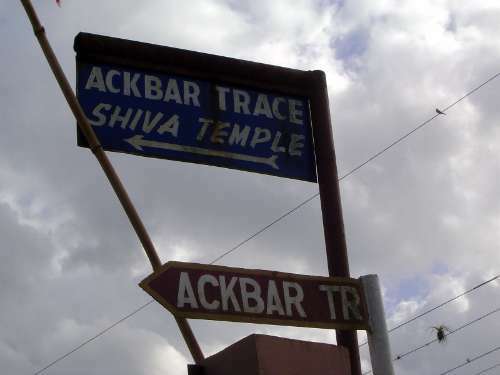 Trace means "lane," but Ackbar (perhaps) refers to Akbar. 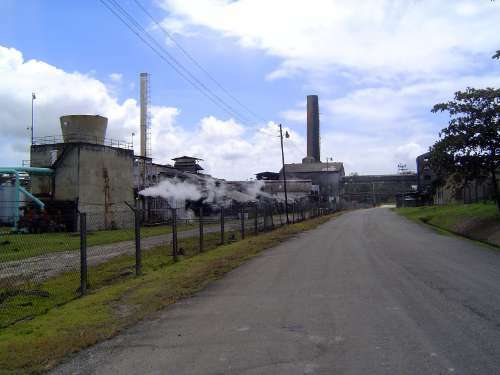 Main refinery of the Sugar Manufacturing Company Ltd., east of San Fernando. 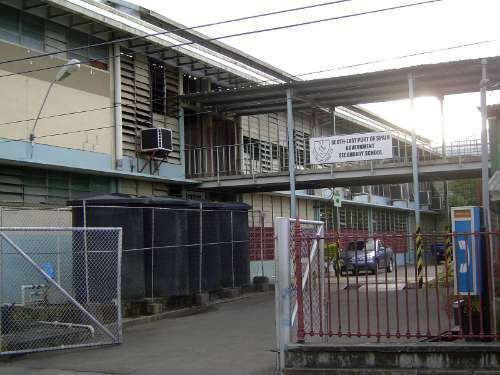 This is one and same as the old Usine St. Madeleine, built by the New Colonial Company. 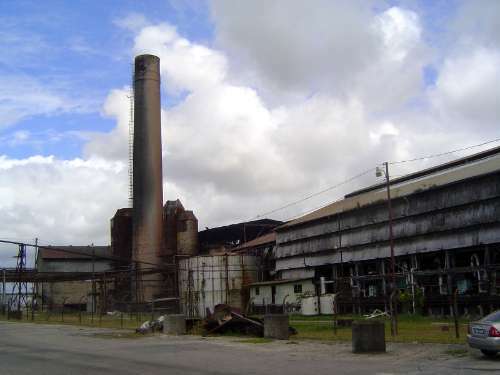 In 1910, it made 16,000 tons of sugar, almost a third of the island's total production. "In the busy crop time the mills grind day and night without cessation whenever possible, for time is precious, the harvest must be gathered in and the juice extracted and converted into crystals before the wet season commences." 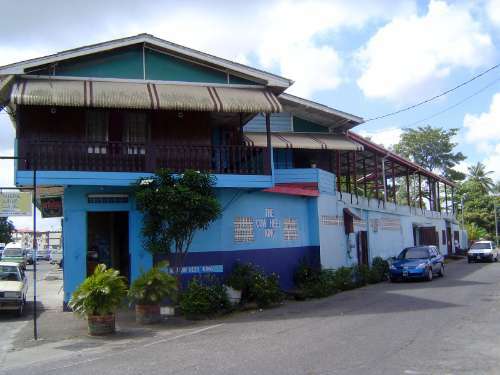 From The Handbook of Trinidad and Tobago. For the Use of Settlers. 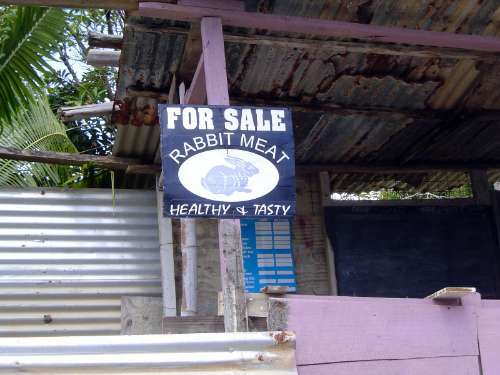 Prepared by a Committee of the Board of Agriculture. J.H. Collens, ed., 1912, p. 61. 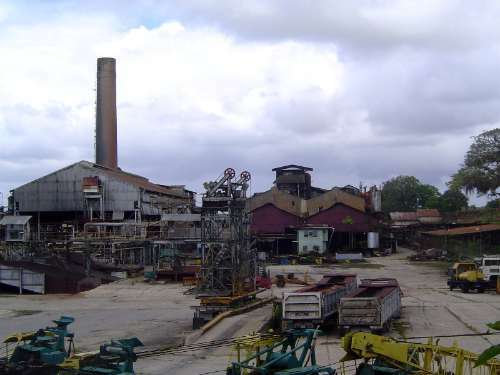 The old Ste. Madeleine Staff Club. 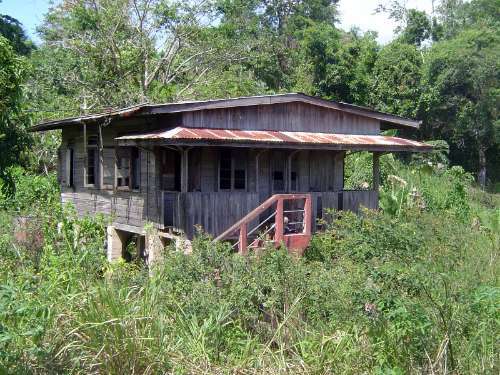 British colonial offices at Siparia, south of San Fernando. 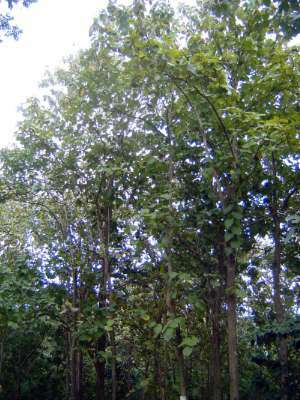 Trinidad's first Forest Officer was appointed in 1901. 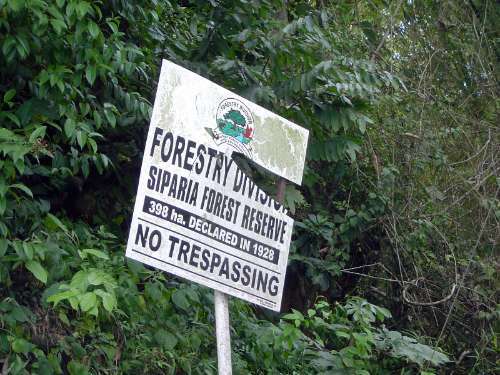 A decade later, 266 square miles of forest reserve had been demarcated. 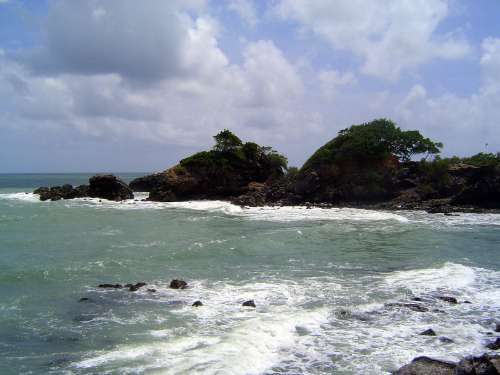 One of hundreds of small settlements on the island. 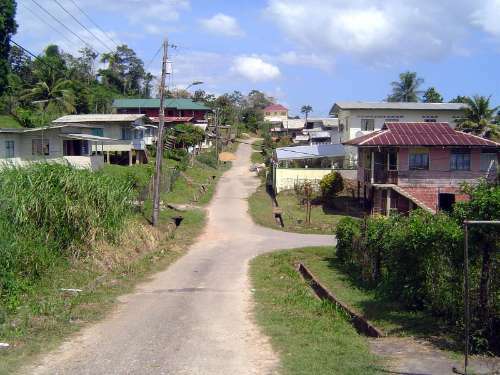 This is Jacob Settlement, west of Siparia. There are plenty of houses like this one. 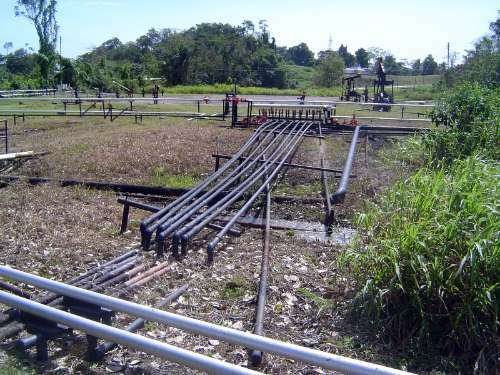 Oil wells and pipelines litter the surrounding landscape.